As a surrogate, you will be giving the greatest gift ever to your intended parents — the gift of parenthood. During your surrogacy process, you’ll likely create a strong personal relationship with the intended parents, and it may be one that lasts for a lifetime. Of course you can! Like you would in any other close friendship, you may think about getting your intended parents presents for special occasions — including the delivery of their child. But, what is appropriate when it comes to giving your intended parents a gift? If you are considering giving your intended parents a present or other commemorative item, we encourage you to contact your surrogacy specialist at 1-800-875-BABY(2229) for suggestions. Your specialist is the one that knows your surrogacy situation best, which means she can provide the best guidance for moving forward on this issue. In the meantime, here are a few ideas you may consider as you think about giving a gift to your intended parents. You and your intended parents will forever be bonded by the precious life you bring into the world — which means that you both will have a great deal of love for this little bundle of joy. As you’re considering gift ideas, you may think about something that you can get for the baby. Many surrogates enjoy picking out a new outfit, a special toy or something else that the little one will enjoy. 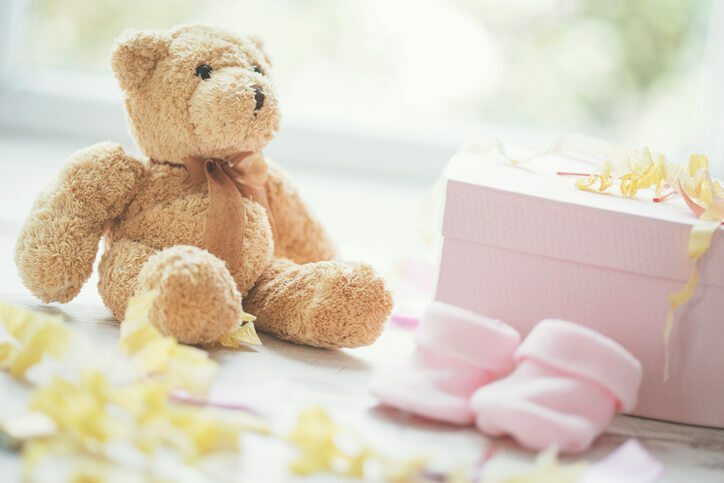 Giving this to the intended parents at a baby shower or after delivery can be a natural thing, which can eliminate some of the awkwardness of giving and receiving gifts during the surrogacy process. Many intended parents who choose surrogacy do so to have their first child. This means they will become parents for the first time and, therefore, be responsible for caring for a child for the first time ever. Because you are a parent yourself, you may choose to get them a “first-time parent” kit, or another useful item like a diaper bag, playpen, or more. Think about what you wish you had in advance when you had your first child, and consider gifting that to the intended parents to make their adjustment a bit easier. If you choose to give your intended parents something special, keep in mind that handmade, heartfelt gifts are often the best to give. You don’t have to spend a lot of money on a gift for an intended parent, should you choose to give them a gift at all; they will appreciate anything that goes above and beyond the incredible gift of life you are already giving them. A few wonderful handmade gifts include blankets, paintings, pictures, baked goods and more. Think about what some of your talents are, and find a way to incorporate them into a gift that your intended parents will enjoy! When you complete a surrogacy journey with your intended parents, you are part of a partnership that you will remember for years to come. So, you might consider gifting the intended parents something that celebrates the journey you took together. While they will always have something to remind them of their surrogacy journey (their child), there are also some other great ideas for commemorating the partnership you made with them. People choose to document and celebrate their surrogacy process in several ways. Consider creating a surrogacy memory book of your pregnancy for the intended parents and the child, buying a piece of jewelry or figurine representing surrogacy, or put together something as simple as a beautifully framed picture from your delivery. You’ll always have your surrogacy memories, and these kinds of gifts will help them stay strong forever. As a surrogate, you are never under any obligation to get your intended parents any kinds of gifts. After all, you are already giving them the most priceless gift you can. You are choosing to sacrifice your time, body and energy to help bring a child into the world; you don’t have to do anything additional. The most important thing to do is to focus on having a healthy pregnancy and delivery. If you aren’t sure about what kind of present is appropriate for intended parents, or whether to give your intended parents a present at all, remember that your surrogacy specialist is here to help. She can provide suggestions for what is best in your situation and make sure that all parties in the surrogacy process are comfortable as possible. No matter what you decide to do, your intended parents will forever be grateful for the surrogacy decision you have made.